The Samsung Galaxy S2 is a high-end Android device because of it's1.2 GHz dual-core System on a chip processor. It also features 1 GB of RAM, but sometimes it also experience some hang or frozen problem. It just sometimes freezes without no means, and this reportedly happens very rare. This may occurred due to the phones memory getting too, low like for example, running multiple applications, scrolling down long texts or phone book that happens once in a while, etc. Once your Samsung Galaxy S II is frozen it become unresponsive, the first thing you only have in mind is to restart the phone. You may either pull out the battery and insert it back again, or just by pressing the power button will also do. A. You may need to reboot the phone by pressing the power button until the device turned OFF and reboot automatically. B. Perform a factory data reset. This will restore back and reset the Galaxy S2 to its factory default settings. 4. if the password is prompted just enter it then select Erase Everything to confirm. C. Hard reset the device by way of button combination- this can be useful if the procedures above doesn't fix the problem. Just ensure to have a back up copy of all of your important data stored on the device for this will wipe and delete all of it. -Release the Power button until the device Turns On. 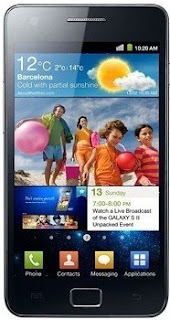 -You will then see a window called "recovery menu" on your Galaxy S2. The options is in there to, Wipe Data/Factory reset, Reboot. Just select Reset Factory. Then reboot. If the above procedures like factory reset or hard reset doesn't fix the frozen problem. Our next option for this is by restoring the device original stock-firmware. This will clean up and return the phone to its original factory fresh like the way you bought it brand new. A Samsung flasher tool called ODIN Multidownloader can do the job. You can find some tips on how to restore back the device Firmware flashing or downloading procedure on Samsung Galaxy S2. Sometimes there are severe hang or frozen problem that is due to hardware issue if the device suffered wet or water damaged, heavily dropped and oxidation build ups inside the phones PCB board, and this problem can only be fix by hardware calibration. A mobile phone technician in a service center with a good soldering skills can only fix it.